The textbook is called Vistas, 5th edition, @ $220.00 (this includes the loose-leaf edition, online workbooks, and website access for additional work and testing for three years) (purchased from the publisher/distributor: bundle prices are good as of 6/20/2017). We supply you with the information in order for you to be able to directly make your purchase from the distributor/publisher. Again, please keep in mind that these materials shall only need to be a one-time purchase, as they contain all of the materials that we utilize for all three years of Spanish 1, 2 and 3! (This also includes your shipping costs)- All class times are live and originate out of the Eastern Standard Time Zone-via Holly Hill, Florida (near Daytona Beach), and though we enjoy being accessible for the students and families, this especially needs to be remembered when the sometimes necessary telephone calls are being made to the instructor (especially those living in all other time zones)... This year's classes will be approximately 1 hour 30 minutes for each class session, for 2 days each week per class unit. Any missed classes are "made-up" via their own class recordings, or the student may visit another comparable class. We also have free tutoring available for specific remedial work. Teacher/Guardian/Student conferences are also utilized for specific needs during the school year! Though being technologically and academically advanced in our studies, we still retain the interpersonal skills and interest that are highly necessary for every successful foreign language program! With all of this information in mind, remember to also peruse our 2019-2020 (to print soon) class schedule that is posted below and please note that there are multiple class opportunities that allow you to choose a time that best fits your schedule. After you choose your class schedule for the upcoming school year, it is necessary that you are to be expected to stay on that track. If you find that it is an absolute "must" for you to change days and/or times, by all means we will attempt to accommodate you, but we can’t guarantee that we’ll be able to make a change if your particular class needs classes are full. Our drop/add period for the 2019-2020 school year is through to September 30, 2019, this is to include no refunds. By Summer of 2019, we will be posting our Registration Form and making it available on the HomePage under Products in the Form/Certificates section: via "Download the High School Registration Form". to be completed so that your enrollment in class can be guaranteed by your registration! (Please call us and we can email you a Registration Form if you are ready now to register) You may register and pay your enrollment fees for the class through our website... or by check via snail mail...or please call us at (386) 677-0421 and we can schedule you an opportunity to register and pay by phone. to pay via checks(at homeschool conventions or mail) and/or cash(at homeschool conventions) gives you a per student class fee price of $430.00. If you would like to try an online question/answer "session" to see how it works, we can also make these arrangements! The price of the class is $450.00 per school year. We've researched various costs of similar programs and our prices are very very reasonable! 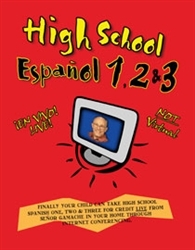 As noted above, we are several years now of teaching LCD High School Spanish Live! Online classes, and our graduated students' accomplishments are telling the continuing story of the benefits of studying with La Clase Divertida for High School! We are having students who are clepping some of their foreign language requirements for college, as well as adequately utilizing their Spanish speaking skills in Life/Community -giving involvements with groups such as charity and missions organizations with immensely positive results! For more information please call us at (386) 677-0421!